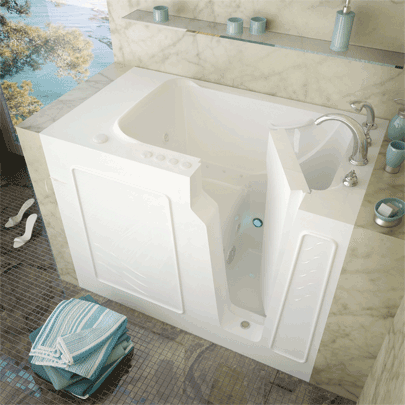 The Meditub 2952 walk-in bathtub features Meditub’s knee cutaway technology. The door can be placed on the right or left side and has a knee cutaway so that the bather can open and close the door while seated in the 17″ ADA Compliant contoured seat. This walk in tub is perfect for new construction and/or retro fitting because of its industry standard size. It is available in several variations such as with whirlpool only, air only, with a combination of both whirlpool and air systems (dual system), or as a soaker, with no jets at all. The premium air system comes with (a_jet) advanced warm air bubble massage jets and is adjustable up to three speeds. Air system is assembled with self cleaning feature also includes a free 300 watt Internal Heater, rated at 15 Amps 120 Volts AC, 1 Nema plug. Dual Massage System combines Hydro & Air System to provide a truly luxurious bathing experience. Air Switch finger tip touch controls make adjusting water flow and jet options as easy as touching a button.